A 1st Battalion, 150th Aviation UH-60 Blackhawk, from Army Aviation Support Facility #1, based in West Trenton, surveys the destruction of the World Trade Center on the afternoon of Sept. 11, 2001. Photo by Tech. Sgt. Mark Olsen, NJDMAVA/PA. 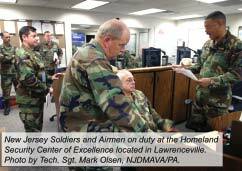 The New Jersey National Guard instantaneously opened its Emergency Operations Center at Fort Dix 24/7 once the emergency began. As the situation developed and New Jersey’s emergency response community began to react, the National Guard Emergency Operations Center directed all of the Major Commands to prepare to provide military support. Communication was quickly established with the New Jersey Office of Emergency Management (OEM) and the National Guard liaison cell was established at the State Emergency Operations Center (EOC). Additionally a liaison cell was dispatched to support the New Jersey OEM Forward and Unified Command Posts at Liberty State Park and Caven Point. The Headquarters and subordinate operations centers maintained 24- hour command and control throughout the initial response period and were stood down as the situation and mission requirements allowed. 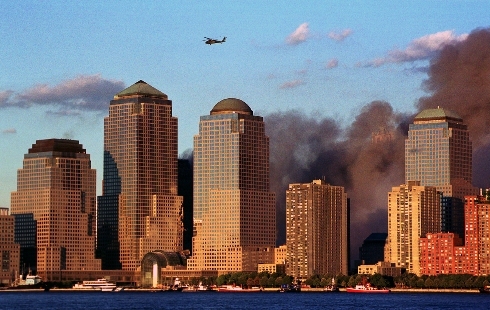 Nearly every Army and Air unit, was involved in security, recovery, and logistical support missions or military operations connected with the September 11 Attack on America. Additionally, New Jersey Naval Militia personnel were called to duty to augment the Emergency Operations Center and assist the State Police with port and maritime security tasks. 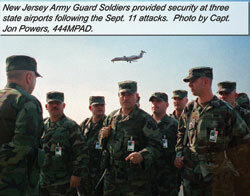 The following covers the major missions and operations conducted by the New Jersey National Guard in response to the Sept. 11, 2001 terrorist attacks. 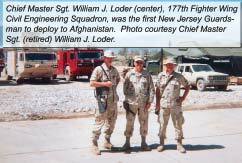 The 177th Fighter Wing of the New Jersey Air National Guard stationed at the Atlantic City began conducting Combat Air Patrol (CAP) operations immediately following the World Trade Center attacks on the morning of Sept. 11, 2001. Fighter Wing to quickly reconfigure its aircraft and begin flying CAP missions shortly after the attacks. In the ensuing weeks nearly all of the Airmen of the 177th provided direct support to the response and recovery effort. More than two hundred Airmen were called to active federal service by the Presidential Call-up. 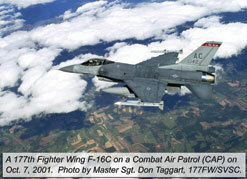 NORAD discontinued routine CAP missions over the homeland on April 16, 2002, but the ASA mission continues. Although a significant portion of the organization was deployed to Incirlik Air Base in Turkey, the 108th Air Refueling Wing (108th ARW) immediately began preparing its people and aircraft to supporthomeland defense by providing air refueling for the Combat Air Patrol (CAP) missions operating in the Northeast Corridor. 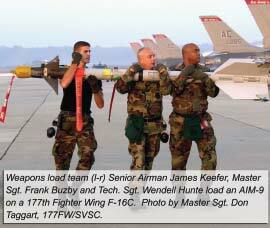 Full-time and part-time Air Guard volunteers were supporting these missions. In the days following the attacks, more than two dozen Airmen volunteered for duty under Noble Eagle and reported to “Ground Zero” in New York City. 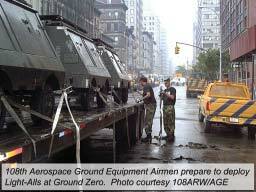 Their mission was to provide, operate and maintain mobile lighting equipment, “light-alls,” at the disaster site. After the light-alls were installed, the 108th Airmen joined the search for survivors. and Enduring Freedom to provide security for government installations throughout the Washington, D.C. area, as well as performing other security-related missions. In additional, 177th Security Forces Squadron Airmen were federally activated and deployed to Air Force bases nationwide to assist with security. Many of these Airmen were deployed for up to a year. 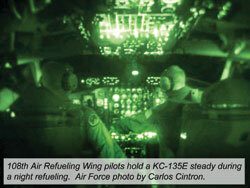 During this period the 108th continued its traditional strategic role to fly routine refueling missions in support of daily Air Force missions. 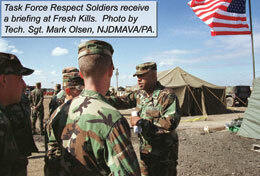 The 57th Troop Command, headquartered in Atlantic City, established “Task Force Respect” at the Fresh Kills Landfill, Staten Island, N.Y. The Task Force provided base camp and life support for the FBI and other law enforcement personnel working at the site. The Guardsmen supported the site with mobile kitchen trailers, cooks, water and medical teams, mechanics, refrigerated trailers, tents, generators, lights and other equipment as needed. Task Force Respect Soldiers also provided a 24-hour guard force at the Homeport housing area on Staten Island where law enforcement and recovery workers were billeted during the emergency. Additionally, National Guard and N.J. Naval Militia chaplains at the camp provided 24-hour religious/ spiritual support and pastoral counseling. National Guard chaplains statewide selflessly provided around-the-clock counseling to families, deployed personnel and rescue workers in all locations from Ground Zero to Atlantic City since the start of the emergency. 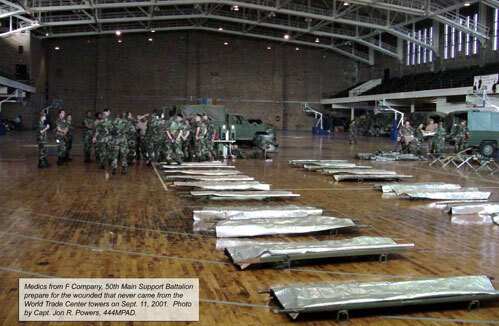 Task Force Respect concluded its mission and closed the Fresh Kills base camp operation on Oct. 25, 2001. The 42nd Military Police (MP) Company supplemented the Department of Defense Police and active duty MPs to enhance 24-hour security at Fort Dix. The Soldiers conducted patrols and operated checkpoints at every gate to the post in addition to their main responsibility to provide 24-hour security for the National Guard Emergency Operations Center. 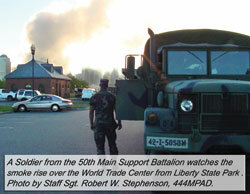 The Company performed its Fort Dix security augmentation role through Oct. 21, 2001. 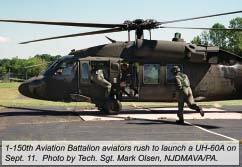 Army Guard helicopters based at Trenton-Mercer Airport provided daily support, beginning the morning of Sept. 11, to the FBI and other federal agencies conducting postattack operations. Missions included support to both crisis management and consequence management activities and included transportation of essential personnel and materials as well as site survey and surveillance over flights. More than 110 missions were flown by 1st Battalion, 150th Aviation Blackhawk and Kiowa helicopters in direct support to the Sept. 11 attacks. the principal agency responsible for managing donations during major emergencies. In excess of 4,000 tons of donated material were received, sorted, and warehoused in connection with the World Trade Center response and recovery operations. 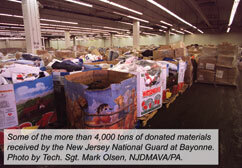 DISCOM assisted with the distribution of materials and the consolidation of remaining items into a central facility when the Bayonne Warehouse closed in mid November 2001. 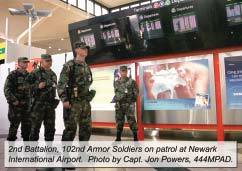 On Oct. 2, 2001, at the request of the President of the United States, Acting Governor Donald DiFrancesco ordered more than 150 N.J. Army National Guard Soldiers to provide additional security at three of New Jersey’s airports. Armed NJARNG Soldiers were stationed at every security checkpoint at each airport. Public reaction to the presence of National Guard Soldiers was very positive and helped to instill confidence back in the American people. This mission was completed once the Transportation Security Agency and new federal security measures were in place in the nation’s airports. In response to the President’s call for increased National Guard presence at airports through the Holiday Season, Governor DiFrancesco authorized the mobilization of a surge force of an additional 40 Soldiers for deployment to the three airports. The additional Guardsmen served from Nov.15, 2001, through Jan. 7, 2002, and augmented security during the holiday travel period. Soldiers, drawn from the battalions of the 50th Brigade, assisted in conducting luggage checks, perimeter patrols, access control and provided general terminal security. 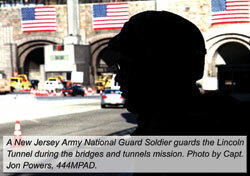 On Oct. 27, 2001, the Governor ordered the Army National Guard to deploy troops in support of the New Jersey State Police and the Port Authority of New York and New Jersey to enhance security at key bridges and tunnels in the New York metropolitan area. “high value” infrastructure and was not based on specific threats to these facilities. This unprecedented use of armed Soldiers in a “State Active Duty” role became a model for other states in the deployment of Guard Soldiers in support of civil authorities. At it’s peak, more than 200 Soldiers augmented police security at key Port Authority facilities in New Jersey including the George Washington Bridge, Lincoln Tunnel, Holland Tunnel, and PATH facilities. Initially Soldiers came from combat units of the 50th Brigade. The first unit called to this duty was the 2nd Battalion, 102nd Armor, headquartered in Port Murray. Units deployed for bridge and tunnel security operations on approximately three week rotations. While deployed, the Soldiers were housed at armories in Teaneck, Jersey City and Woodbridge. Thier duties included security of key buildings and transportation hubs, cargo inspections at river crossings, and traffic control at security checkpoints. Once each of the Battalions of the 50th Brigade completed a three week rotation, the operational responsibility rotated among the DISCOM battalions until the mission was completed by the 250th Signal Battalion late in March 2002. Governor DiFrancisco ordered more than 75 Soldiers from the 50th Brigade to State Active Duty on Nov. 8, 2001, to augment existing security at New Jersey’s two nuclear power stations. Although no specific threats were identified against the Salem and Oyster Creek facilities, it was considered a prudent precaution to bolster security at these key facilities following the commencement of U.S. military action in Afghanistan. This mission and manning levels were reevaluated and tailored to meet the fluid situation on a regular basis and remains active today with a minimal force. Virtually all New Jersey Air National Guard personnel, in one status or another, answered the call to support Operation Noble Eagle (ONE) and Operation Enduring Freedom (OEF). Almost 95 percent of the more than 2,400 New Jersey Citizen-Airmen were directly involved with providing either OEF or ONE Combat Air Patrol mission support. NJANG Airman deployed within the United States and overseas including Southwest Asia and Afghanistan. Additionally, the NJANG continues to participate in Operation Deny Flight in the Iraqi No Fly Zone. Not surprisingly, the existing Command and Control infrastructure quickly became overburdened exposing systemic difficulties with the management and support of several widely diverse civil support and security enhancement operations. It became ever clearer that the New Jersey National Guard had to make significant improvements to existing processes and procedures to remain a relevant partner within the state’s response community. Additionally, the new homeland security environment presented increasingly complex challenges that required new operational capabilities and skill sets. Strategic analysis and decision making were focused on building a state of the art Joint Operations Center equipped to handle a newly emerging role in homeland defense and security, revamping the Military Support to Civil Authorities Operations Plan and acquiring the correct array of force structure to address the challenges of contemporary operational environments both at home and abroad. Governor James McGreevey dedicated NJDMVA’s Homeland Security Center of Excellence in January 2003. The facility, to be used by the Department as a command and control center for emergency operations, was funded entirely from existing appropriations and constructed through a team effort of in-house maintenance force, 108th Air Refueling Wing and 177th Fighter Wing Civil Engineering Squadrons and civilian contractors.
. By October, the New Jersey National Guard published a comprehensive Military Support to Civil Authorities (MSCA) Operation Plan (OPLAN) incorporating Army and Air capabilities as well as applicable departmental services and support including State Active Duty pay, medical care and logistical support. The MSCA OPLAN introduced the concept of geographic task organization supplemented as required with special capabilities. This structure established the ‘Guard Force’ concept and has enhanced the improved habitual relationships between National Guard commanders and the supported civil authorities. In November 2003, the New Jersey Weapons of Mass Destruction (WMD) Advisory Committee, facilitated and led by the NJNG, published the first WMD Appendix to the Terrorism Annex of the state’s Emergency Operations Plan. The committee was comprised of members of all major departments of New Jersey state government and representatives from various law enforcement, response and support sectors involved in emergence preparedness and response. 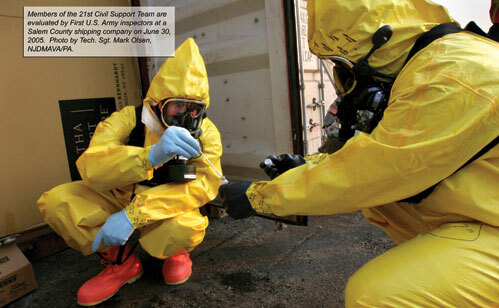 WMD Civil Support Teams deploy rapidly to assist the local incident commander in determining the nature and extent of an attack or incident; provide expert technical and medical advice on WMD response operations; and help identify and support the arrival of follow-on state and federal military response assets. Each team consists of 22 full-time Army and Air National Guard members who are federally resourced, trained and exercised. 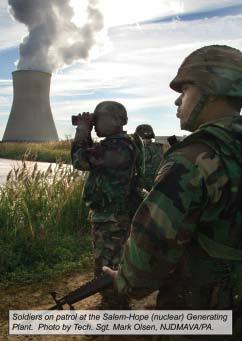 Early in March 2004, as a result of an aggressive campaign led by the Department of Military and Veterans Affairs with strong support from the Governor and the state’s legislative delegation, Congress authorized and funded the stationing of the 21st Weapons of Mass Destruction Civil Support Team (21st CST) in New Jersey significantly enhancing the states’s domestic emergency preparedness and response capabilities. Following 15 months of intense individual and collective training, the 21st CST passed its final evaluation by the First United States Army inspectors and was certified mission capable on June 30, 2005.
on July 12, 2002, Maj. Yarko Sos, 177th Fighter Wing, flew the 1,000 Combat Air Patrol in the United States. Photo by Senior Airman Andrew Merlock Jr., 177FW/SVSC.